Whenever you come across some unfamiliar word or term online, you most probably try to look for some info on it. Infonaut offers users a shortcut to such information, with a pop-up window that gives you a standardized definition from Wikipedia and some related search tabs. However, Infonaut may also be considered an adware application, and as such it could easily expose you to unreliable websites without you even realizing it. Therefore, to ensure your system is protected against any potential intruders, you should remove Infonaut from your computer without any further ado. Unlike most of the adware programs that have dysfunctional homepages, Infonaut actually has an official website that works. It is possible download and install Infonaut from infonautapp.com. On the other hand, seeing how users complain about this application we can infer that they seldom download Infonaut directly from the official website. Not to mention, it is not that easy to come across the website unless you are looking for this one application. Hence, it is far more likely that users install Infonaut along with some other freeware applications without paying much attention to it. In other words, most of the time, Infonaut comes bundled with freeware applications that are widely available from file sharing websites. Infonaut functions as a browser extension and upon installation it adds a plug-in to Google Chrome, Mozilla Firefox, and Internet Explorer. Users do not notice anything at first because Infonaut takes its time collecting data on your web browsing habits. However, if you highlight some word on a web page you will notice Infonaut’s icon next to it and clicking the icon will make another window pop up on your screen, offering you the most basic information on the highlighted word. If this is something you do not want to see, Infonaut should come across as a relatively annoying application. On top of that, Infonaut may also track your web browsing habits in order to generate customized commercial advertisements. This happens because Infonaut is an ad-supported application, and it needs to display third-party advertisements in order to cover its development costs. The problem is that some of those ads could contain unreliable third-party content, and if users click them accidentally, it could redirect them to corrupted websites. You have to avoid any potential threats at all costs, so remove Infonaut as soon as possible. Since there is a good chance that you have more unwanted applications on your computer, you should scan your system with the SpyHunter free scanner and delete all the potential threats as soon as possible. Do not hesitate to leave us a comment if you have any further questions. Open Uninstall a program and remove Infonaut. Select Uninstall a program and remove Infonaut. 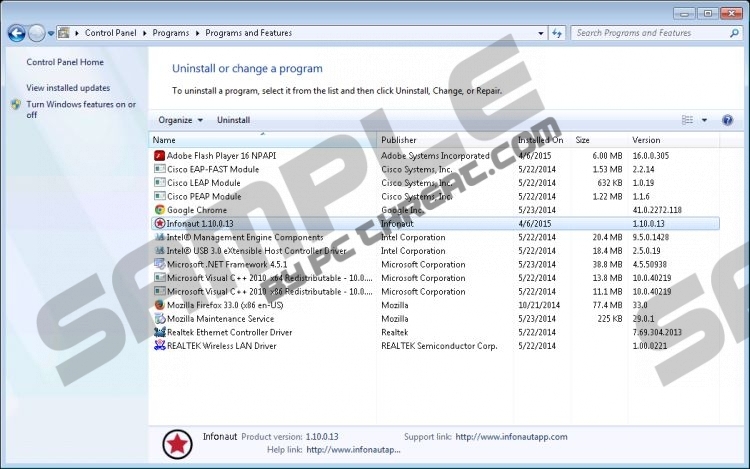 Access Add or remove programs and uninstall Infonaut. Quick & tested solution for Infonaut removal.